The Cape Cod Baseball League boasts some of the top college players on its rosters each summer, so it’s little surprise to see so many selected in the MLB First-Year Player Draft each year. For the past six years, well more than 200 draft selections played for one of the teams on the Cape, and the numbers continue to grow. Appel may not have been on the Cape for long, but his eight-inning, 10-strikeout performance against Orleans in the 2011 playoffs was the stuff of legends. He returned to Stanford for his senior year despite being drafted by the Pirates in 2012, electing instead to earn his degree in management, science and engineering. He became the program's all-time strikeout leader (372) and finished the year with a 2.12 ERA and a 10-4 record. More stunning were the 130 strikeouts he posted this year alone. Bryant, a third baseman and outfielder from San Diego, put up big numbers at school this spring, leading Division I schools in home runs with 31 (all DI schools, not just his conference). On the Cape in 2011, he had three home runs, 29 hits, 16 runs and 16 RBIs. 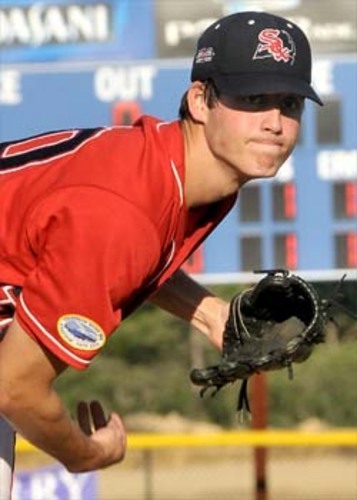 Team USA picked him up in 2012, where he played with a number of fellow CCBL alums. Moran played for the Braves in both 2011 and 2012, and is the only alum on this list of first-round (and competitive balance round draftees to have played two All-Star games during his tenure on the Cape. In 2011, Moran posted a .289 average during the regular season, and in 2012 he joined the 300 club with a .314 average. His 50 hits and 42 runs made him the guy to watch, and likely explains his return appearance on the All-Star roster. Not only did DJ Peterson get drafted in the first round, but he also had the pleasure of watching his younger brother, Dustin, get selected by the Padres in the second round – a family affair! The elder Peterson saw action in eight games for Hyannis last summer before departing for Team USA. Anderson notched 42 strikeouts in 32 2/3 innings of work during his short stint with the Y-D Red Sox. Gonzales played a short few games in Falmouth last summer. While his hitting was so-so in 11 plate appearances, he managed a 1-0 record on the mound with a 2.70 ERA and 13 strikeouts. His win came against the powerful bats of Harwich on June 15. He pitched a solid five innings against Wareham a week later, notching eight strikeouts before coming out. Gonzalez turned in a 3.07 ERA during the regular season as one of the Y-D Red Sox starters. At school this past spring, he kept that number around 1.83, with a 9-5 record and 126 strikeouts. Eric Jagielo terrorized opposing pitchers last summer, belting 13 home runs. He earned himself a trip to the All-Star game, hosted at his home field in Harwich. He hit .291 over the course of the regular season, with 46 hits and 29 RBIs, helping lead his team into the playoffs. Like Jagielo, Ervin made a name for himself thanks to his power at the plate. In the first week of games, he had already outpaced the 2011 home run leader. While his bat cooled off a bit, he still managed 11 round-trippers, earning himself a spot right beside Jagielo at the All-Star game. Ervin scored 29 runs with 31 RBIs and 42 hits, batting a respectable .321 and even pitching a scoreless three innings against Brewster in early August for a 5-1 win. His accomplishments earned Ervin the Pat Sorenti MVP award at the end of the season. Stanek pitched three games for Bourne in 2011, with 16 strikeouts in 16 innings before heading to Team USA. The righty went 10-2 in 16 appearances this season for the Razorbacks, with a complete game and a 1.39 ERA. With a .270 average and 27 hits, Judge was among the top hitters for Brewster last year in terms of batting average, and his five home runs didn’t hurt. Moreover, he went back to college this last year and led his teammates in nearly every hitting category – a .369 average, 45 runs, 76 hits, 36 RBIs, and a .461 on-base percentage. Sean Manaea was a name few knew before his dazzling performances last summer for Hyannis. Manaea led the league in strikeouts, earning himself Outstanding Pro Prospect and Top Pitcher honors from the league. He also landed the starting nod for the West All-Star squad in last summer’s battle of the best. Blair earned himself the starting pitcher's role last summer at the All-Star game for the East Squad, in large part due to his 1.17 regular-season ERA (he finished the year with a 1.05 ERA). He was lights out in the postseason, fanning 16 in 12 innings of work (for a 0.75 ERA), and finished the season with 60 K's overall – triple his number of walks, and nearly double the number of hits he allowed. He had two 10-strikeout games: once against Brewster on June 28, and the other against Wareham on Aug. 16. Lorenzen played for Team USA in 2011 and came to the Cape in 2012 after 14 games with USA. In eight games, he had a .161 average with five hits and a homer. But back at school this past season, Lorenzen had 73 hits, 53 RBIs and 40 runs, and boasted a .415 average.